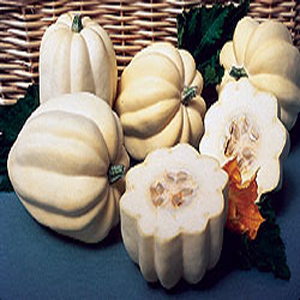 The White Swan, White Acorn or Swan White acorn squash when mature is hard and encased in a thin creamy white to pale yellow hued skin that when cooked is edible though most often it is discarded. 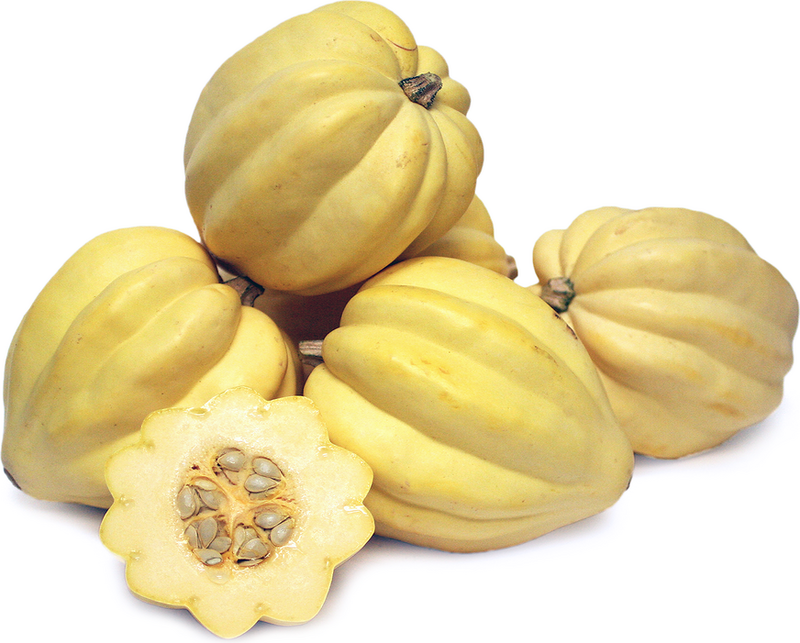 The pale yellowish-gold flesh of the White acorn squash is mild and sweet, with a smooth, delicate texture. 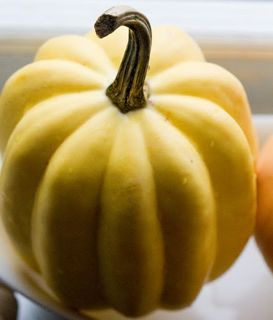 Somewhat ovoid-shaped and pointed at the bottom, acorn squash is easily recognized by its thick, characteristic, longitudinal ridges which give it the appearance of its namesake. 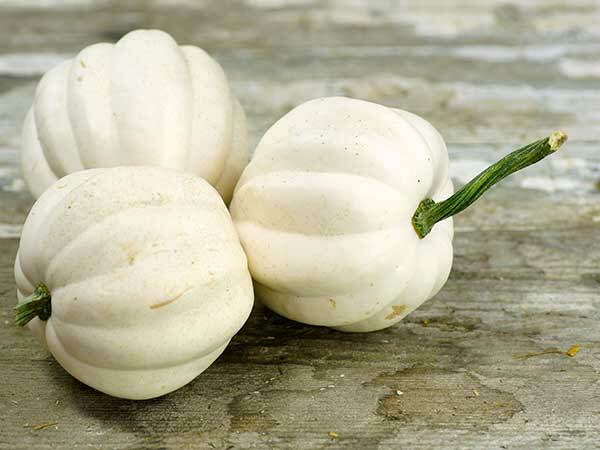 While the traditional Green acorn squash was domesticated by Native Americans the White acorn squash is a fairly new variety that was developed in the 1980�s by squash collector and expert Glenn Drowns. 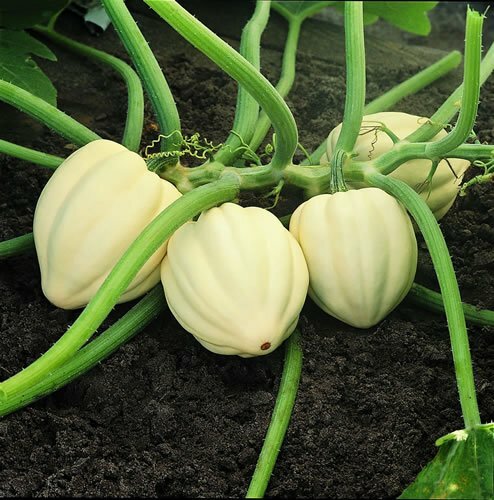 Known as a �bush acorn� variety the White acorn squash is also a popular garden squash since its fruits grow in a compact bush. 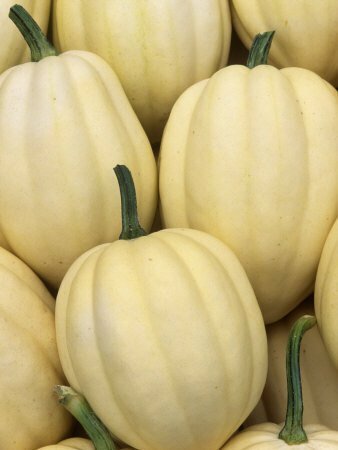 A stunning white pumpkin that tastes like an acorn squash. 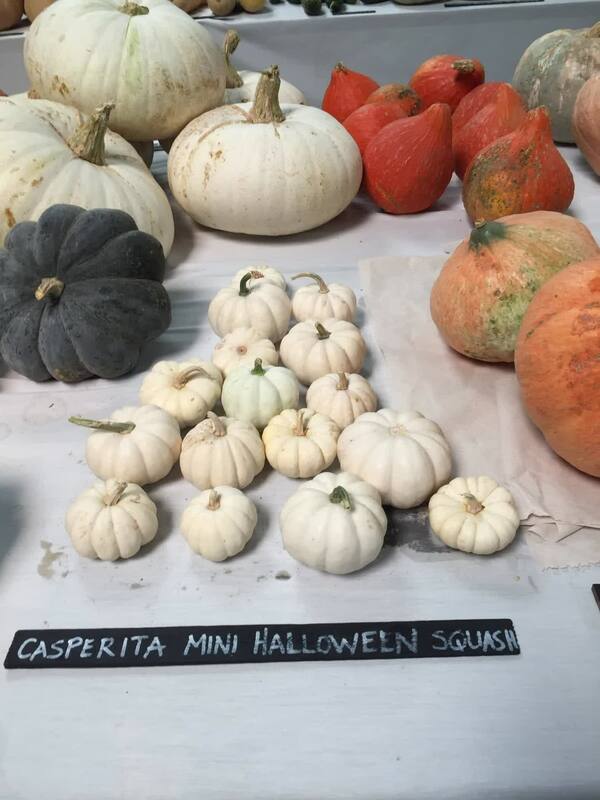 Small, 1/2 to 1 lb., globe-shaped, ribbed fruits have classic pumpkin shape and light orange flesh of excellent quality that can be used like acorn squash. Semi-bush plants are high-yielding with tolerance to Powdery Mildew. F1 hybrid white acorn. 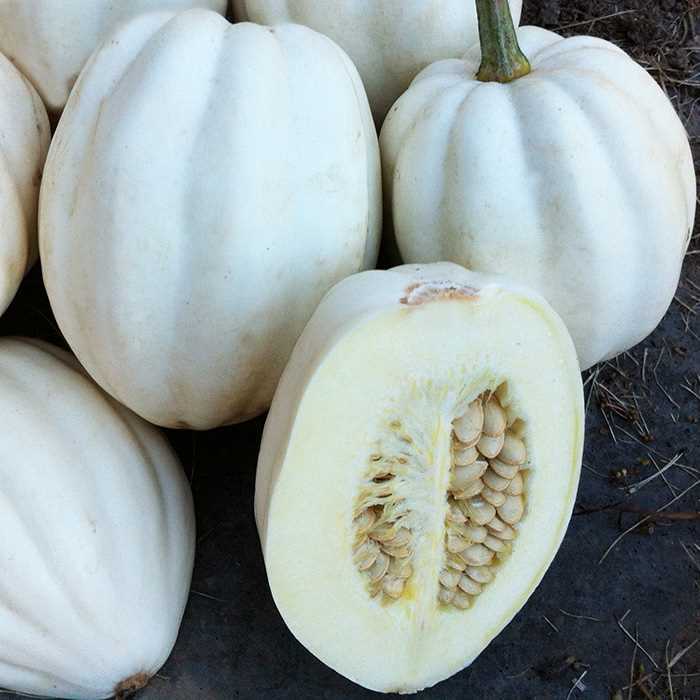 Compact bush type plant produces high yields of 2 lb white acorn squash. This gourmet squash has extremely high quality white flesh. Very flavorful. 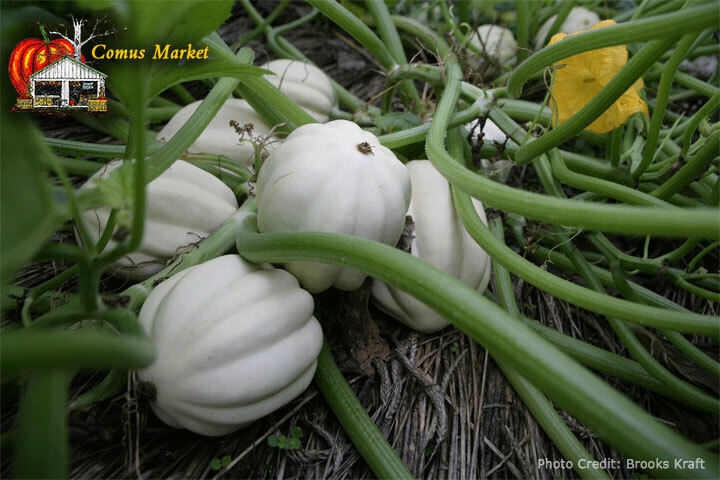 Excellent choice for home gardens and specialty market growers. Might be also known as "Mashed Potatoes". 90 days. MO USA: Pro: Prolific Con: Too Mild. Good if you like a very mild flavored squash. Great production (averaged about 6 per plant) storing well; however, I prefer a bolder/sweeter flavor. 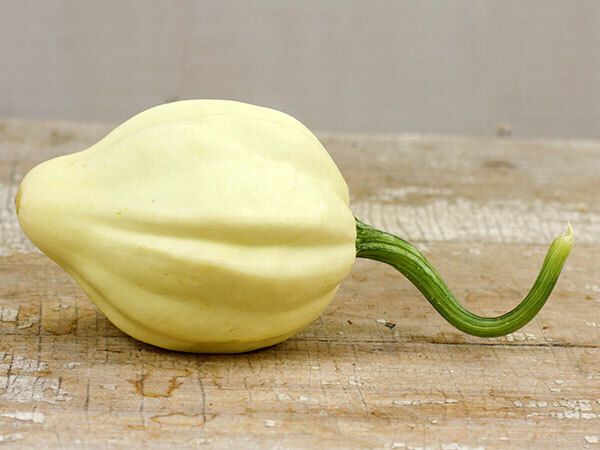 IL USA: Squash is 9 inches long rather than round. May round out as they mature. Planted from 3 inch pots in mid May. Nice yellow in color. Will wait till stem turns black as I do for my regular Acorn Squash. Just picked first Acorn Squash. Will buy Cream of Crop again. Sligo, North West, Ireland: Pro: mild flavour Con:Didn't plant enough. Planted this squash and hoped for the best. It did very well, even in the worst summer in Ireland in many many years. 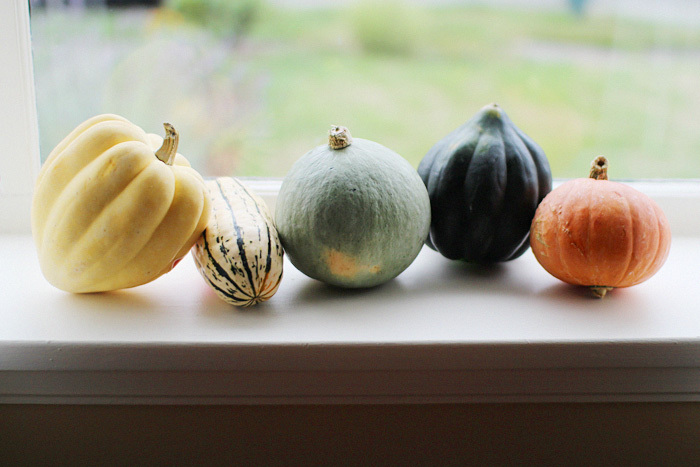 It was rained on, had cold weather and very little sun but still produced good numbers of squash outside. WY USA: Pro:Prolific, easy to grow Con:long vines, not compact. easy to maintain, I got dozens of medium sized squash from 2 plants! I picked some young and they were very tasty as a sauted summer squash, and let others mature and harden outside and they stored well for at least 2 months. Wasn't a compact plant by any means though, it had at least 10 foot vines. Worth the space in my opinion.